In the Sage Hills, whitetop often forms a sea of sweet-smelling white flowers. Whitetop grows upright from a single stem eight to twenty inches tall. 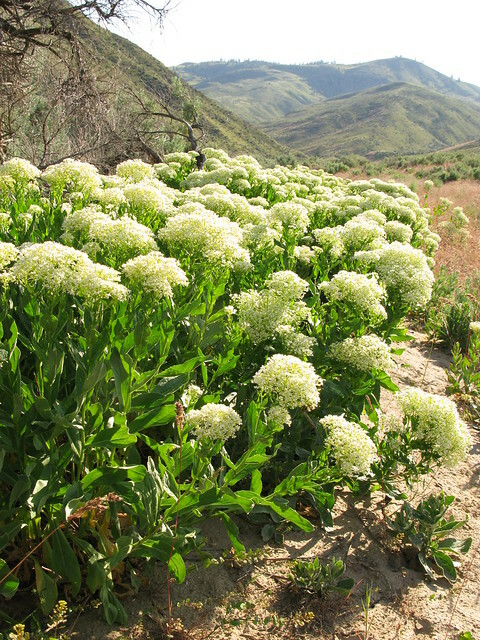 The flower head is typically flat-topped and dense with white flowers. Flowers have four widely-spaced petals. The lower leaves form a rosette at the base of the stem and are somewhat hairy and lance-shaped and two to four inches long. Higher on the plant, the leaves clasp the stem with two ear-like lobes and have fewer hairs. Whitetop is an invasive weed that forms dense patches that can completely dominate sites, restricting the growth of other species. It spreads primarily by extremely persistent roots and will eventually eliminate desirable vegetation and become a monoculture. One plant can produce 1200-4800 seeds, and buried seeds remain viable for three years. In absence of a competitor, a single plant can spread over an area twelve feet in diameter in a single year. It is difficult to control whitetop due to its perennial root system, abundant seed production, and ability to survive in diverse habitats. Pulling it or mowing before it flowers and sets seed reduces seed production but does not eradicate existing populations.